Jetpack 5.2 brings you a brand new Contact Form experience, a better explanation of recommended features, and several performance improvements. Jetpack’s Contact Form for WordPress is one of our most popular free features. And with good reason: it’s the simplest and most effective way of enabling your readers to get in touch with you be it for praise, complaints, requests or suggestions. And now we’ve made it much simpler and faster to use. The next time you add a contact form to a page on your site you will see a new visual interface right inside the editor instead of a popup. Enjoy a full editing experience including adding and customizing fields and labels, re-ordering them by dragging, and easily setting email subject lines and recipients. Click on the contact form and then the “Edit” icon in order to add new, change the order of, or delete fields in your form. Simply drag and drop your fields to organize their order the way you want them. Click “Update Form” at the bottom when you’re done to save your changes. 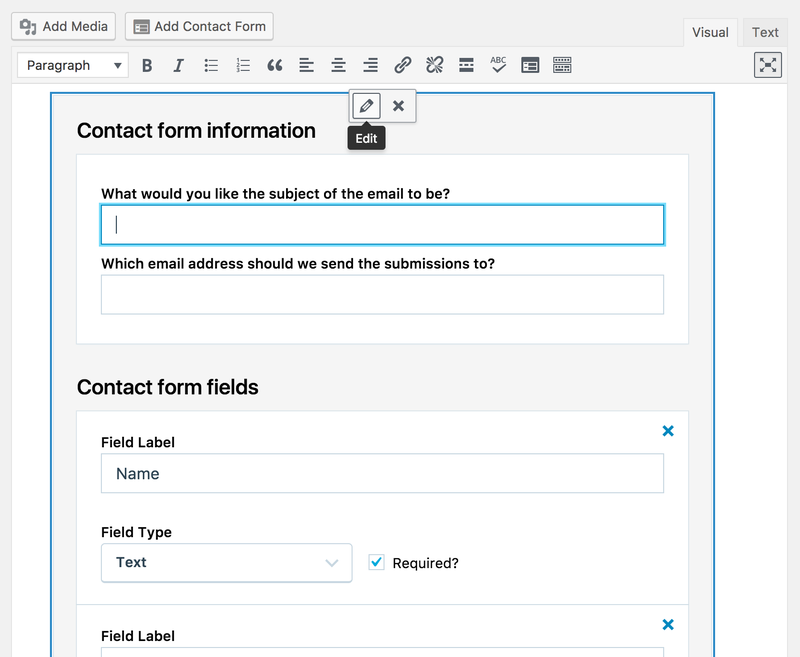 Click “Add Field” at the bottom of your new contact form to add new fields. Click “Update Form” to save your changes. When you install Jetpack on a new site, Jetpack recommends activating certain popular features that are most valued by users. Jetpack has now improved this experience to better showcase and explain what the features and how they benefit your WordPress site. Jetpack has also streamlined and reduced weight (file size) of the plugin as well as fixed bugs and introduced enhancements for stability. All these are under the hood ensuring a smoother Jetpack functioning with each version. The changelog provides the full list of updates and changes in this release and if you have feedback please get in touch as always. Install Jetpack on your site or upgrade your current version today and Jetpack know what you think. Alexandru Bucur, Anthony, Artur Piszek, Ben Lowery, Brandon Kraft, Daniel Walmsley, Derek Smart, Donncha Ó Caoimh, Drew Butler, Elio Rivero, Eric Binnion, Filipe Varela, George Stephanis, Igor Zinovyev, Marko Andrijasevic, Michael Arestad, Michael Turk, Miguel Lezama, Mohammad Jangda, Payton Swick, Richard Muscat, Rob Landers, Stephen Edgar, Thomas Guillot.